At left, an exceptionally rare F2 tornado passed directly through downtown Salt Lake City in 1999. At center, a wide but weak tornadic circulation damaged skyscrapers in downtown Nashville in 1998. While officially rated an F3, the storm caused no damage indicative of such intensity. At right, some of Atlanta’s tallest buildings were struck by an unexpected nighttime tornado in 2008. All three storms caused tremendous monetary damage but only one fatality each due to their modest strength. Despite popular misconception, the downtowns of large cities are no less prone to violent tornadoes than the farmland that surrounds them. High-rise districts are rarely larger than one or two square miles, so they sit as small and widely spaced targets across the storm prone regions of the United States and Canada. Tornadoes have caused well over 1 billion dollars in damage and approximately 100 fatalities in the centers of major cities since 1950. As of this writing, however, no tornado* has ever caused violent (EF4/EF5) damage in the downtown area of a large city. Below is a list of all strong (E/F3+) tornadoes that have impacted the downtowns of cities with populations greater than 100,000. While all of these storms left impressive damage, none caused the catastrophic devastation that researchers have predicted using modeled scenarios. Analyses of spatial distributions have indicated that a single tornado could take well over 10,000 lives within the boundaries of a major population center (Wurman, Alexander, Robinson, Richardson, 2006). After decades of relative complacency, the 2011 storm season proved that modern civilization is still no match for an EF5 tornado. *The Gainesville, Georgia, tornado of 1936 caused violent tornado damage in the city’s central business district as well as over 200 fatalities. The population of Gainesville, however, is less than 50,000. A sudden burst of heavy rain sent weekend shoppers scrambling for shelter in downtown Waco on May 11th, 1953. From inside the many multi-story businesses lining 4th and 5th Street, people watched as the afternoon sun was quickly extinguished by a massive thunderstorm. An “inpenetrable darkness” swept over the city streets, causing the few driving vehicles to switch on their headlights (WCCC.TV, 2012). Dozens of customers in the five-story R. T. Dennis Building, a large furniture store on 5th Street, watched from the plate glass windows as hail loudly banged against parked cars. The storm was growing in intensity when an ominous roar was heard off to the south. After the creation of the Fujita Scale, the Waco tornado was retrospectively given an F5 rating. Photographs, however, indicate that home damage in the vicinity of downtown was in the F2 and F3 range. 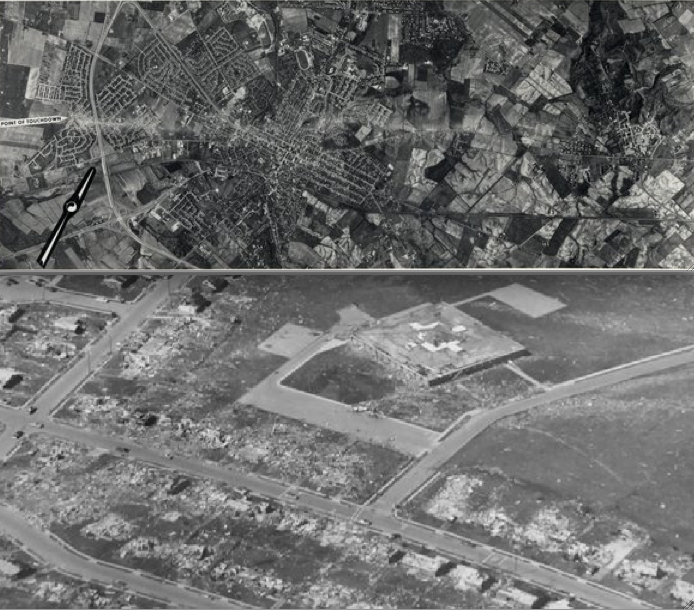 The low concentration of fatalities in the residential sections of the city, coupled with the survival of most of the city’s large buildings, indicates the storm was likely under F5 intensity in the areas documented by local media. At left, aerial view of the damage in downtown Waco. The 22-story ALICO Building (far left) was less than 100 yards from the destroyed R. T. Dennis Building (Image from The Texas Collection). At right, view of the devastation on 5th Street. Ground views of the devastation in downtown Waco. The tornado was likely at F3 or marginal F4 intensity in the downtown area. The Topeka tornado was clearly visible and fairly slow-moving, which allowed more than two dozen photographers to capture the storm from various vantage points. Here the tornado is seen churning through Burnett’s Mound at peak intensity. One of the most well-known tornadoes of the 20th century touched down near Old Pauline Road in Shawnee County, Kansas. The large and widely visible funnel was reported by several police officers and weather service employees as it roared to the northeast towards the city of Topeka. Just east of Sherwood Lake, the rapidly intensifying tornado swept a home completely away, killing the two occupants. The storm’s moderate forward speed, which averaged 30mph, gave residents in the outer suburbs of Topeka more than ten minutes to seek appropriate shelter. By the time the barrel-shaped tornado reached a housing development along Interstate 470, it was at peak intensity. Rows of small tract homes were reduced to bare concrete slabs and vehicles were hurled more than two block and mangled beyond recognition. Most of the storm’s fatalities occurred in this area. The tornado swept over a freeway overpass where a group of people had sought shelter, leading to several critical injuries. As the tornado moved into the city, it weakened slightly but continued causing a pronounced swath of F3+ damage. 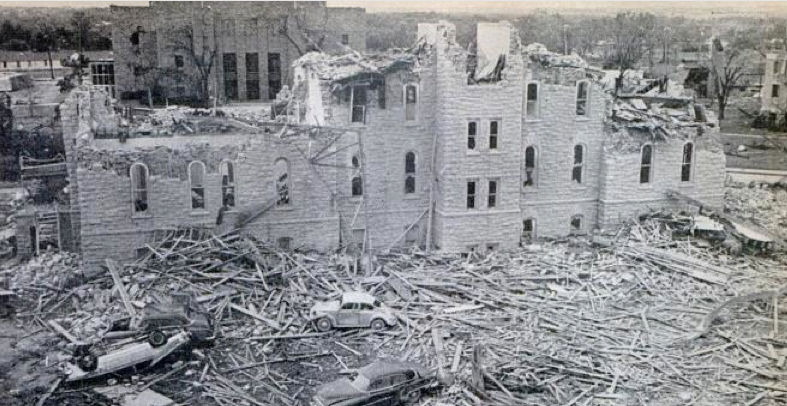 A large apartment complex was impacted directly by the tornado, yet only one of the 100 or more people who did not make it to the building’s storm cellar was killed (Fales, 1967). The storm crossed over a mile long section of Big Shunga Park, momentarily sparing residential areas of the city. After tearing across 21st Street, the tornado passed over the main campus of Washburn University. More than a dozen large, stone buildings at the college were severely damaged – some having their upper floors sheared completely off. Fifty students and faculty survived in the southeast corner of the school chapel’s basement. The “safe” southwest corner of the basement, where the group intended to hide, was buried in thousands of pounds of debris moments later (Fales, 1967). A 300lb piece of stone originating from the college was hurled two miles and found atop the Topeka Municipal Auditorium (Fales, 1967). As the storm continued to the northeast it ripped through downtown Topeka at marginal F3 intensity. The state capitol and a ten-story building suffered window and roof damage, but no fatalities were recorded in this area. East of downtown, the tornado flipped planes at the municipal airport before narrowing and dissipating. The tornado caused 14 deaths in Topeka an 16 overall (Hoots, 2010). After the Fujita Scale was created in the early 70’s, the tornado was given an F5 rating due to the home damage near Interstate 470. Most of the homes were small and not well-built, however, so the damage may not be indicative of F5 intensity. The low number of fatalities was likely the result of the tornado’s slow movement, wide visibility and moderate intensity north of Big Shunga Park. At left, view of devastation near the I-470, where the most intense damage in Topeka was documented (Image by Rich Clarkson). At right, Rick Douglas narrowly survived the tornado after being blown out from beneath an overpass and caked in mud and debris. (Image by Delmar Schmidt). After causing intense damage in southwest Topeka, the weakening tornado passed through the southern end of downtown. Windows were shattered in some of the city’s tallest high-rises, and the capital building suffered roof damage. 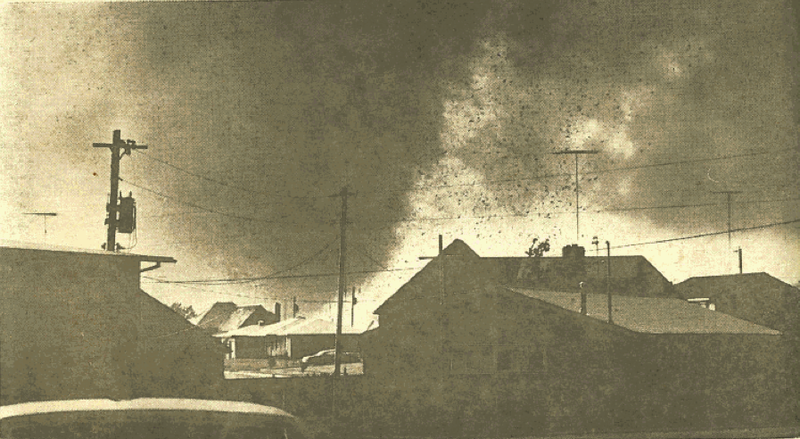 One of the most important tornadoes in US history touched down in Lubbock, Texas, on a stormy night in May of 1970. The tornado’s damage path commenced a few blocks southwest of the city’s high-rise district, which included two buildings over 200ft in height. Downtown Lubbock was bombarded by hurricane force winds as the tornado widened to over a mile in width and slowly meandered to the north. Windows were shattered and several unreinforced brick walls collapsed, but the damage was fairly light in the city’s business district. The tornado’s first victim was killed several blocks west of downtown in the collapse of a small home. The massive storm intensified as it turned northward into the Guadelupe neighborhood, a low-income district with many poorly built homes. Widely spaced suction vortices left narrow strips of intense devastation surrounded on all sides by moderate to mild damage. Eight people were killed in the Guadelupe area, most in homes that were leveled to the ground. Extreme streaks of damage were documented as the tornado crossed a tributary of the Brazos River and entered an industrial area. A 26,000lb, 41-ft long fertilizer tank was hurled nearly a mile across a freeway without leaving any visible impact marks. Several large oil tanks were also carried more than 300 yards, and a railroad car was rolled 50 yards (TTU, 1970). Sixteen people were killed near loop 289 of the US 87, several of them in vehicles swept off the freeway. The deaths included a family of four in a home that was swept completely away (City of Lubbock). Almost all of the residential developments in Lubbock are to the south and west of the business district, so the storm did not impact the majority of the city’s densely populated neighborhoods. As a result, the final death toll was only 26 residents. Following the tornado, a relatively unknown faculty member from the University of Chicago, Professor Fujita, spent more than a week thoroughly studying the storm’s damage. Photographs of the widely spaced streaks of destruction led to our modern understanding of multiple suction vortices, a phenomena that had never before been so clearly documented. The Fujita-Pierson Tornado Damage Scale was also developed as a direct result of research conducted on the Lubbock tornado. The tornado was later given an F5 rating due to the severity of the damage in the northern edges of the city. Most, if not all of the obliterated homes were of questionable construction, so a contemporary EF5 rating may not be appropriate. The movement of large industrial equipment, however, remains among the most impressive instances of tornado damage ever documented. Note: Fujita reported that a “family of five” was killed in a home in the Skyview neighborhood, but no such deaths were recorded by the city. 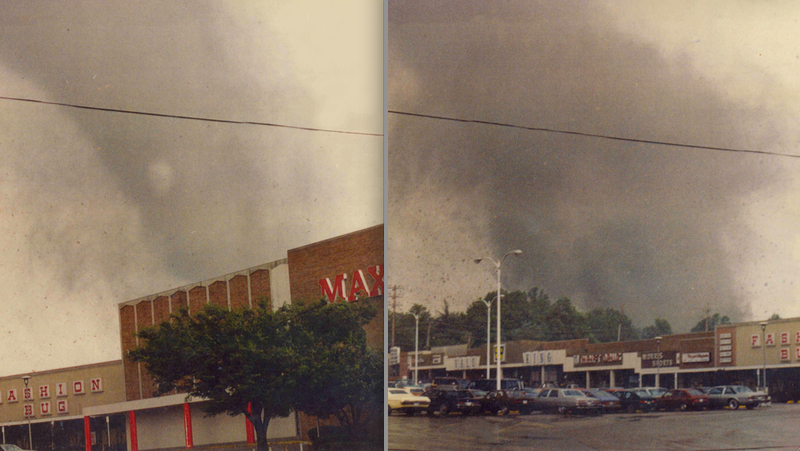 In May of 1980, a tornado descended from the sky over the western outskirts of Kalamazoo, Michigan. The funnel remained airborne for several minutes before touching down just north of Newton’s Airport. Boards and branches whirled through the air as the storm headed eastward, roughly following Main Street towards the center of the city. A laundry business collapsed just before the tornado reached the center of the city, causing the storm’s first fatality (Laurens, 2002). At 4:15pm, the ragged funnel passed directly through downtown Kalamazoo, shattering windows in mid-rise office buildings. Several cars were flipped by winds funneled down narrow alleyways and the entire facade of a seven-story building collapsed onto the street below, killing two women. A motorcyclist riding through Bronson Park in downtown was killed by a falling tree (source, n.d.). In eastern Kalamazoo, the storm’s final fatality occurred when a man loading his truck was thrown to the ground. Surveyors later awarded the storm an F3 rating due to a small streak of heavy damage near St. Augustines Elementary School (NWS Survey). Damage in the city center was indicative of F1 to F2 intensity. Prof Fujita surveyed the damage and deemed the tornado an “extremely rare event.” He incorrectly estimated that tornado’s strike the downtowns of large cities every 50 to 100 years. Note: While the official population of Kalamazoo is under 100,000, the metropolitan area has a population over 300,000. The Dallas/Fort Worth metropolitan area is one of the largest and most vulnerable urban centers in Tornado Alley. 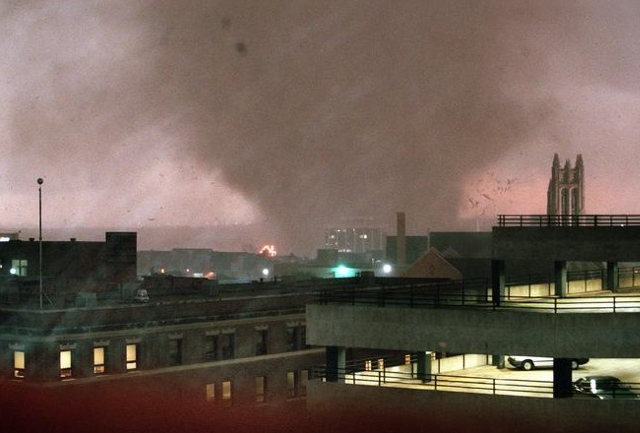 Historical records indicate that the region surrounding the Red River Valley is particularly prone to violent, wide-tracked tornadoes in the months of March and April. To date, more than a dozen significant tornadoes have passed within the boundaries of the two cities, the deadliest of which swept through residential sections of Dallas in 1957. The last killer tornado to strike the area touched down near the Burton Hills neighborhood, about three miles west of downtown Fort Worth. Videographers filmed the large, dusty vortex as it marched eastward towards the city’s tallest skyscrapers. The tornado caused little damage until it reached the Trinity River, at which time it rapidly intensified into a minimal F3. After causing its first fatality at a trucking plant, the storm engulfed the ten-story Cash America building at maximum intensity. Nearly every window in the building was shattered and exterior offices were stripped of furniture. The tornado then began to weaken as it entered the heavily urbanized core of Fort Worth. Howling winds funneled through the downtown streets as the now-transparent tornado whirled debris high into the air. Thousands of windows shattered, raining large pieces of jagged glass to the ground below. High winds knocked over a brick wall where a homeless man had sought shelter, crushing him to death (NWS, 2010). After exiting downtown, the tornado became diffuse and dissipated. Surveyors later concluded that most of the damage in the downtown area was of F0 and F1 intensity. 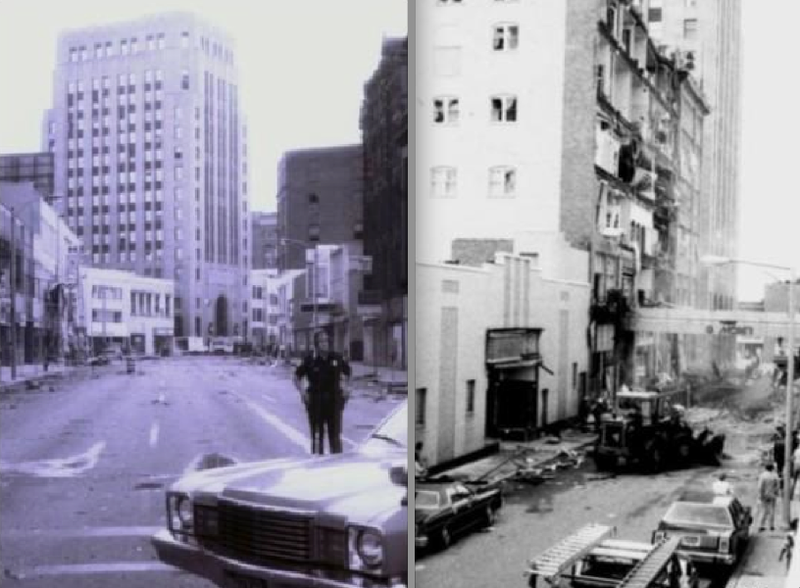 The devastated Cash America Building, however, was likely impacted by winds in the upper-F2/lower-F3 range. At left, damage to the Bank One Building in downtown Fort Worth. At right, the devastated Cash America Building, which was struck by the tornado at peak intensity. Additional views of the Bank One and Cash America buildings. Due to ground friction, tornadic winds increase dramatically with height. Had the tornado not impacted such tall structures, it likely would only have achieved an F2 rating. The Dallas/Fort Worth metropolitan area has some of the most congested freeways in the United States (pictured is the 366 Spur just west of the central business district). Peak traffic flow generally occurs between 4 and 6pm, which coincides with the maxima in violent tornadic activity. Considering the vehicle fatality rate in EF5 tornadoes, a single badly placed storm could cause thousands of deaths on the roads alone, particularly if a rain-wrapped storm were to follow a freeway corridor. A rare supercell thunderstorm in the state of Massachusetts spawned a tornado that touched down in the city of Westfield. The knob-like funnel remained aloft for several minutes as it spun to the east at 30mph. Damage was limited primarily to trees and poorly fitted roofs until the storm entered the city of Springfield, at which point it intensified. Hundreds of vehicles caught in afternoon traffic were struck by the tornado as it passed over the Memorial Bridge, leading to several injuries from shattered car windows. Sheets of water spiraled around the core of the vortex as it crossed the Conneticut River and approached the high-rises of downtown Springfield. Just after making landfall on the other side of the river, a man was killed when a tree fell atop his parked car. Winds in the storm caused extensive damage to multi-story brick buildings just south of the central business district, littering the streets with bricks and downed trees. As the storm exited downtown, it passed over a three-story apartment building on Union Street. The force of the tornado caused the structure to collapse, killing a mother sheltering her daughter on the ground floor (Constantine, 2011). East of Springfield, the tornado reached EF3 intensity as it plowed through miles of forestland. Several homes impacted by the tornado were nearly leveled to the ground in the town of Monson (NWS Survey). The storm’s final fatality occurred when the storm swept through a campground near Brimfield. While the tornado was determined to have been a half mile wide in Brimfield, the worst damage was confined to an area less than 100 yards in width. The tornado finally lifted about eight miles southeast of Worcester, the scene of New England’s deadliest tornado in 1953. The Hudsonville, Michigan, tornado of 1956 is not included in the “strongest tornadoes” list because it occurred before the development of the Fujita Scale. Photographic evidence, however, indicates that the F5 tornado caused some of the most intense wind damage ever documented. Large homes were reduced to bare slabs, vegetation was scoured completely from the ground and vehicles were thrown long distances and mangled beyond recognition. A detailed image gallery of the tornado’s destruction, including full color photographs, can be found here. □ For a tornado to be considered for categorization, it must have caused at least one fatality and occurred after 1970. Damage intensity and, to a lesser extent, wind duration are the only variables considered, without regard to total path length, width or monetary loss. Objectivity is attempted through the use of damage photographs and reliable survey reports. While far from definitive, this list is the result of hundreds of hours of research, e-mails across the country and conversations with other storm chasers. I believe it is as accurate a list as is available. It is flexible and always open to change. Vegetation damage is a fairly reliable method of comparing one tornado to another. 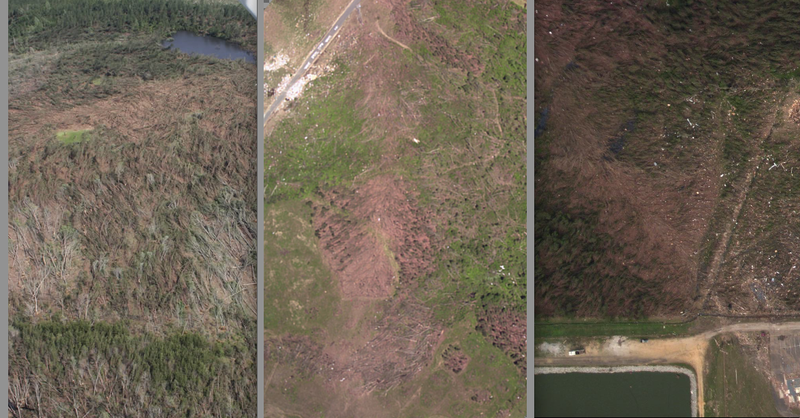 The above pictures show damage to pine trees (with relative intensity increasing from left to right). At left, damage from the Phil Campbell tornado. 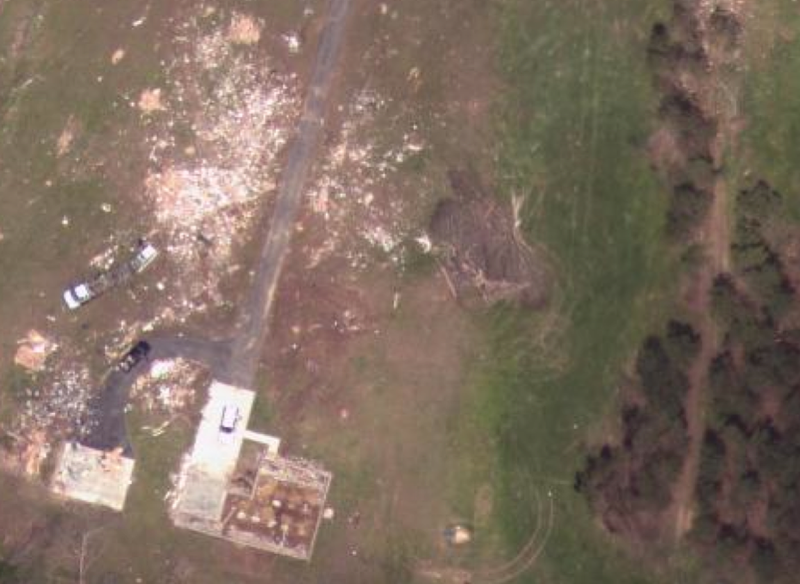 At center, a streak of extreme damage following the Rainsville tornado. At right, a pine forest scoured to the ground in Smithville, Mississippi. The Xenia tornado was at peak intensity and entering Windsor Park when a high school student took the only known film of the storm from his home on Ridgebury Drive. □ On the afternoon of April 3rd, 1974, a violent supercell thunderstorm passed to the south of Dayton, Ohio. At 4:30pm, one of the most well-known tornadoes in United States history touched down just east of Sugarcreek Reserve, nine miles southwest of the city of Xenia. The storm began its life as a series of transient funnels rotating beneath a violent mesocyclone. Over the course of ten minutes, the multi-vortex tornado solidified and gained strength. By the time it reached the western edge of Xenia, winds in the storm had reached F5 intensity. The newly developed community of Windsor Park, which straddled the west side of the US 35, took the full brunt of the powerful tornado as it entered the city. 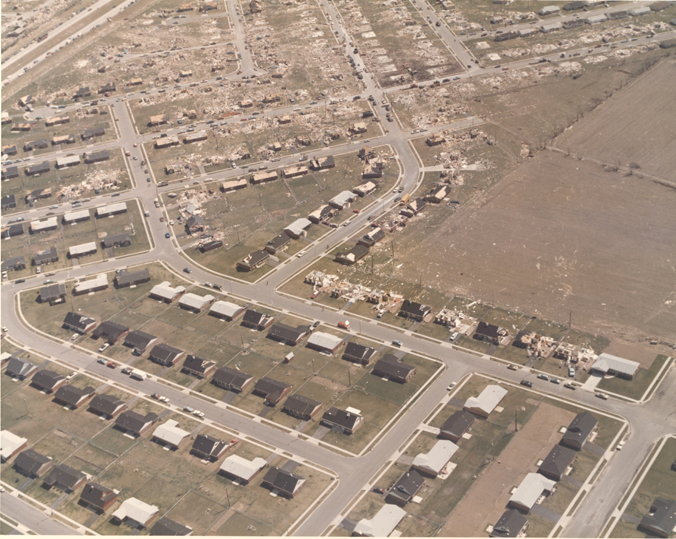 Entire rows of small, brick homes were swept completely away as the tornado ripped through the neighborhood at 50mph. Nine fatalities occurred in six houses that were obliterated near the intersection of Roxbury Drive and Gayhart Court. The deaths included three teenagers, a pregnant woman and a mother and her young son (I Dream of Genealogy, 2012). An aerial damage survey later documented a trail of clean foundations all the way to the US-35. Extreme damage continued as the tornado roared past an elementary school, obliterating homes in the Arrowhead subdivision. Structural damage in the area indicated that the tornado had weakened slightly, with the last instances of clear F5 damage occurring on Wigwam Trail, where two people died. Downtown Xenia was struck by the tornado just before 4:45pm. Businesses and homes in the densely populated center of town were severely damaged, leading to more than a dozen fatalities, including five deaths at an A&W Root Beer stand. In total, 30 people were killed in Xenia, and monetary losses totaled more than 100 million dollars. Three miles outside Xenia, the tornado caused its final two fatalities as it roared through the town of Wilberforce. An extensive search and rescue operation uncovered a total of 32 victims. Two more were killed in a fire during clean up operations, leading most sources to cite 34 fatalities for the event. 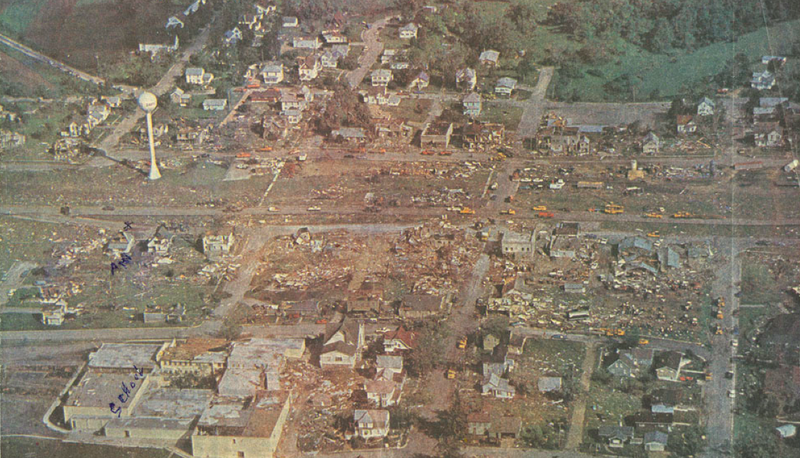 In the weeks following the storm, extensive media coverage descended upon Xenia, which suffered the most damage of any city during the Super Outbreak. Due to the incredible destruction, the Xenia tornado was deemed “the strongest” of the outbreak, a belief that was furthered when it became one of six tornadoes awarded an F5 rating. In reality, damage throughout most of the city was in the F3 range. The number of empty foundations in Windsor Park was impressive, but the houses were small and likely of only moderate construction. 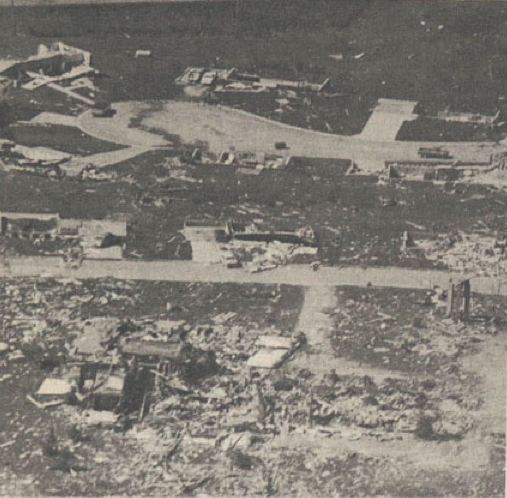 The shear breadth and consistency of the damage in western Xenia, however, solidified the storm’s place as one of the most impressive of the 20th century. Aerial view of Windsor Park, where the most intense damage was documented. 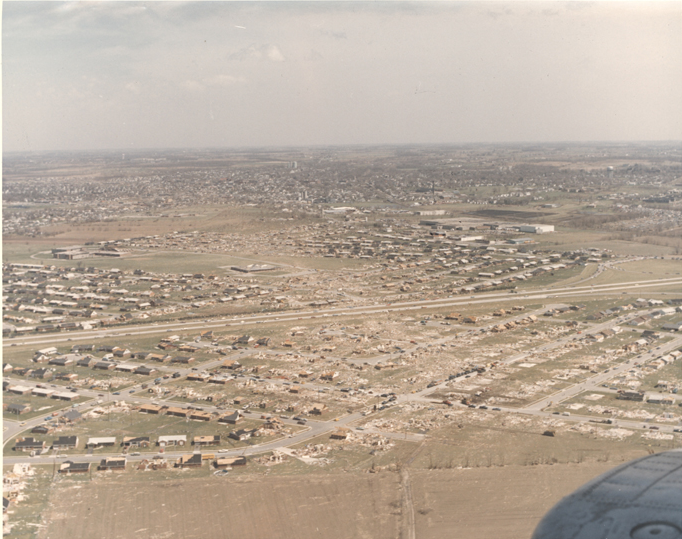 After crossing the US 35, the tornado entered the Arrowhead subdivision, where the final instances of clear F5 damage occurred. Close aerial view of empty foundations in Windsor Park. Nine fatalities occurred near the four-way intersection at top center, primarily on Commonwealth and Roxbury Drive. At left, damage in the Arrowhead subdivision, with pronounced wind rowing near Arrowwood Elementary School. At right, view of F5 damage around the US-35. At top, satellite view of the damage swath through Xenia and Wilberforce. The most intense damage is visible on the west side of town, with the storm’s path becoming less pronounced as it continued to the northeast. At bottom, view of damage around Arrowwood Elementary School. □ On a stormy August afternoon in 1990, an unusual off-season tornado touched down in a farm field to the west of Chicago. The funnel was imbedded within a violent high-precipitation thunderstorm that was traveling southeast towards populated sections of Will County. Heavy rain surrounding the tornado made it indiscernible to those in its path. Conventional weather radar failed to identify a hook echo, so no tornado warning was issued. The sirens across the area remained silent. As the tornado approached the US 30, one mile to the west of Plainfield, the inner core of the storm rapidly intensified and narrowed to only 10 yards in width. Thick clouds of dirt and vegetation were ripped from the ground as the narrow vortex crossed the highway, hurling four vehicles into the air. A tractor hauling a metal storage trailer was impacted directly by the column of F5 winds. The tractor was thrown 100 yards into a cornfield in one throw, killing the driver. The 20-ton trailer was torn from the tractor and centrifuged around the center of the storm, bouncing several times before landing a quarter mile from the road. Another car was lifted into the tornado by violent inflow winds and whirled a half mile through the air without impacting the ground. The driver of the car, who had been wearing a seatbelt, was ejected from the vehicle and found dead later that evening (Fujita, 1993). In total, four motorists were killed in vehicles on the US 30, all of them caught unexpectedly while driving on a rainy day. Before entering Plainfield, the core of the storm expanded to 70 yards in width and weakened slightly. Well-constructed homes on the southern edge of town were leveled, and a large metal dumpster was wrapped around the top of a partially debarked tree. The Plainfield High School was directly impacted by the rain wrapped tornado as it crossed Commercial Street, causing three fatalities. Aerial imagery revealed that the tornado left a pronounced streak of damage as it continued to the southeast at 45mph. Large homes in Lily Cache and Crystal Lawns were splintered in F4 fashion, leading to seven additional fatalities. Near the end of its life, the tornado struck the Crest Hill Lake Apartments. Nine residents died when the top two stories of an apartment building were obliterated. Some of the bodies were hurled more than 100 yards into a cornfield east of the apartments. One boy, who was the sole survivor of a family of four, later told a reporter “I was looking out the window at my brother who was coming home from football practice, and I thought, ‘Man, it’s getting dark.’ Then — boom! — I was out in a cornfield” (Grimm, 2010). 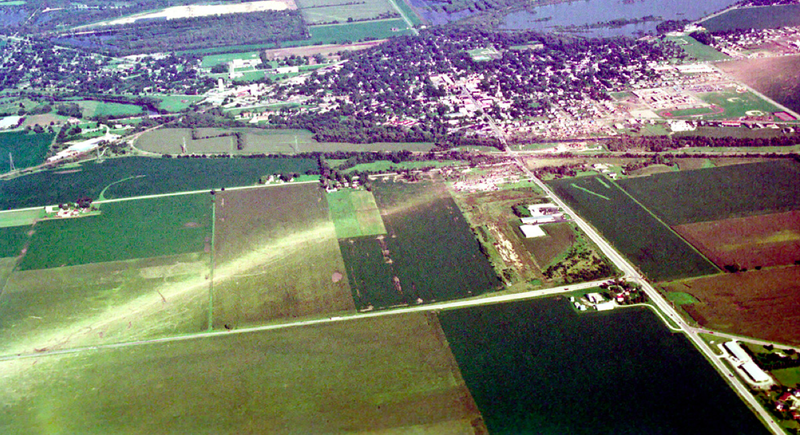 Professor Fujita conducted an aerial damage survey the day after the tornado and selected an F5 rating due to the severity of the vegetation damage around the US 30, which he described as being “comparable to the worst I have ever seen.” According to Fujita, “The damage in the cornfield southeast of US 30 was entirely different from the damage adjacent to structures affected by the F3 or F4 winds…In the worst damage area, corn crops were blown away entirely, leaving behind the remnants of small roots connected to the underground root system” (Fujita, 1993). 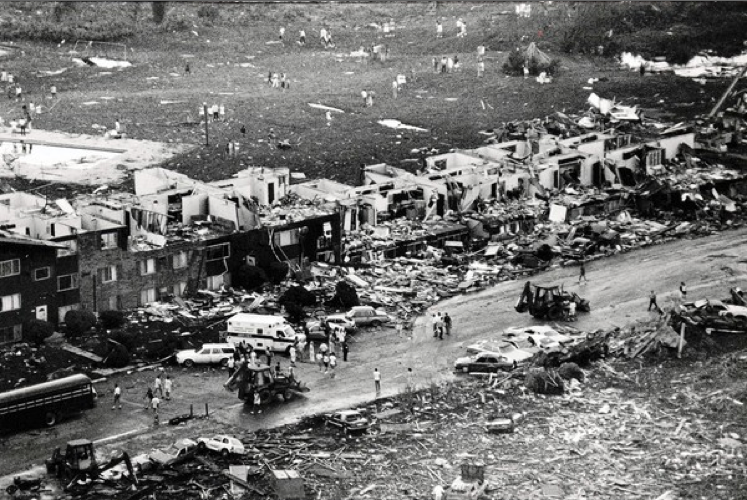 Twenty nine lives were lost in Will County, and more than 200 homes were obliterated. Scenes of destruction in and around Plainfield. At left, the devastated Plainfield High School, which was days away from re-opening for the Fall semester. At center, a mixture of F0 to F4 damage in Lily Cache. Some homes were swept from their foundations, but none were determined to have been well-constructed. At right, a large dumpster that was wrapped around the top of a partially debarked tree. □ In the midst of a nighttime lightning storm on June 8th, 1984, residents of Barneveld were awoken by an electrical surge that sent fire alarms and appliances into a beeping frenzy. Moments later, the power across the tiny town flickered and went out. As people prepared to fall back asleep, a sound like “dry and distant thunder” was heard off to the west. The barely audible rumble soon became a deafening roar, awakening even the heaviest sleepers, some of whom suspected they were in the path of a crashing jumbo jet. A massive surge of wind driven debris followed, and soon a third of the town lay in ruins. 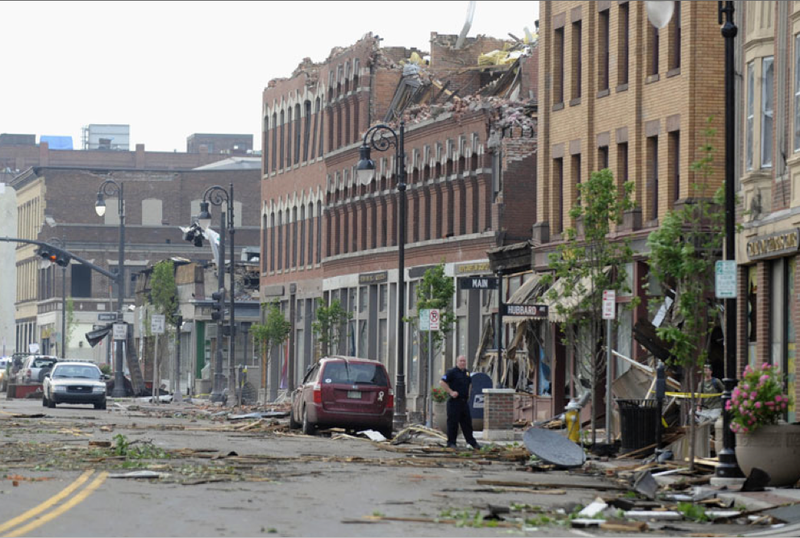 The deadly tornado followed Main Street directly through the center of Barneveld, splintering businesses and homes within its 300 yard wide path of destruction. 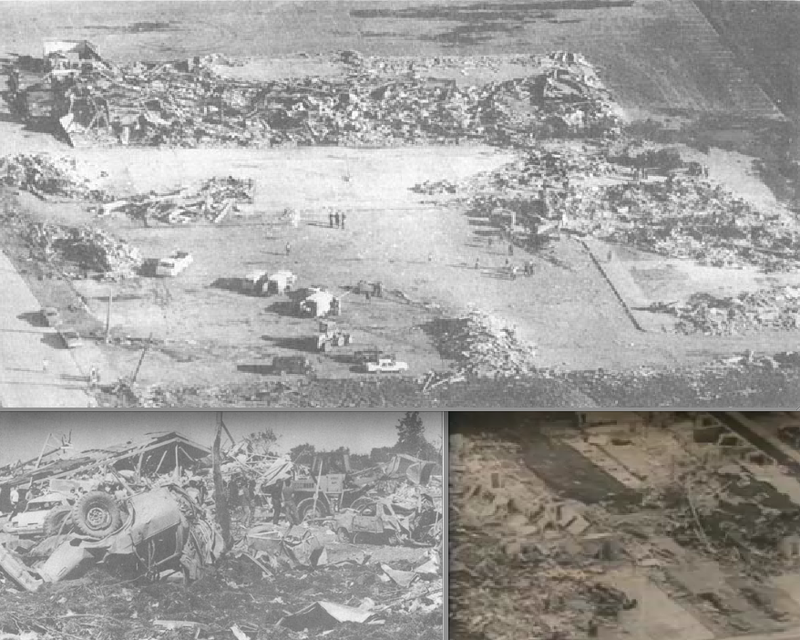 Aerial damage photographs indicate that the tornado was intensifying as it passed through town. On the northeast edge of Barneveld, a cluster of homes on Swiss Lane was swept completely away. Seven of the tornado’s nine fatalities occurred in four adjacent homes in this area. The deaths included a couple and their eight year old daughter who were found 200 yards from their obliterated home. The only surviving member of the family, a one year old boy, was left paralyzed from the waist down (Brueck, Woodard, 2009). Trees near the empty foundations were debarked, and vehicles from the neighborhood were hurled long distances and rendered unrecognizable. Additionally, a large and well-constructed brick church was leveled and partially swept away. A survey team headed by Prof. Fujita awarded the tornado an F5 rating due to the damage on Swiss Lane. The devastation and high concentration of fatalities in the area was indicative of exceptional intensity. Considering the unusual hour that the storm struck, it is remarkable the death toll was not higher. Many of the survivors credited their survival to the power surge, which preceded the tornado by several minutes. □ The Rainsville tornado left an unusual swath of destruction through northeastern Alabama during the 2011 Super Outbreak. The intensity of the damage varied tremendously in affected areas of DeKalb County. In some instances, seemingly undamaged trees stood less than 100ft from well-constructed homes that were swept completely away from their foundations. 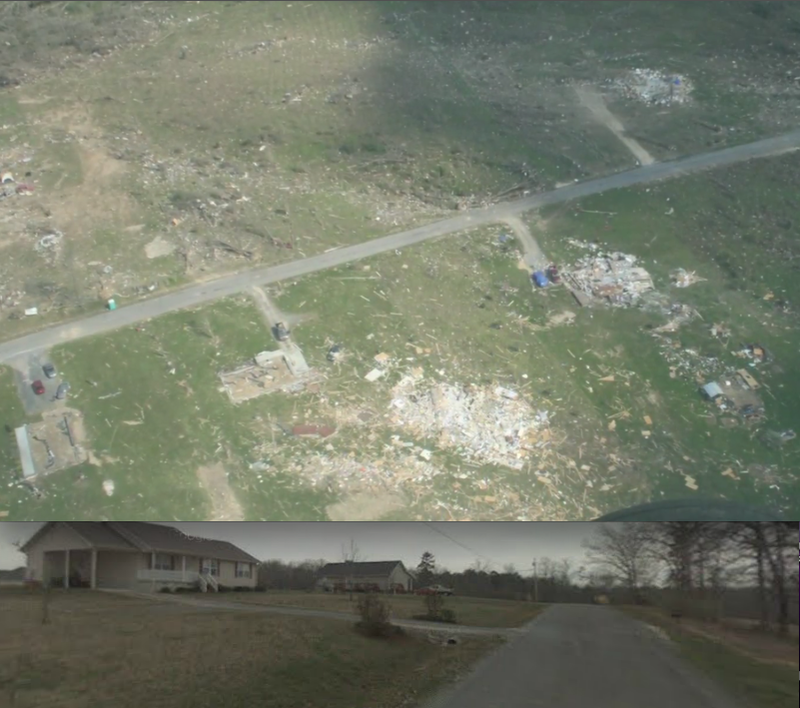 Along the tornado’s 34 mile streak of devastation, 25 people were killed and more than 100 frame homes were obliterated. The tornado touched down east of Fyffe and travelled roughly parallel to Highway 75 at a forward speed of 60mph. 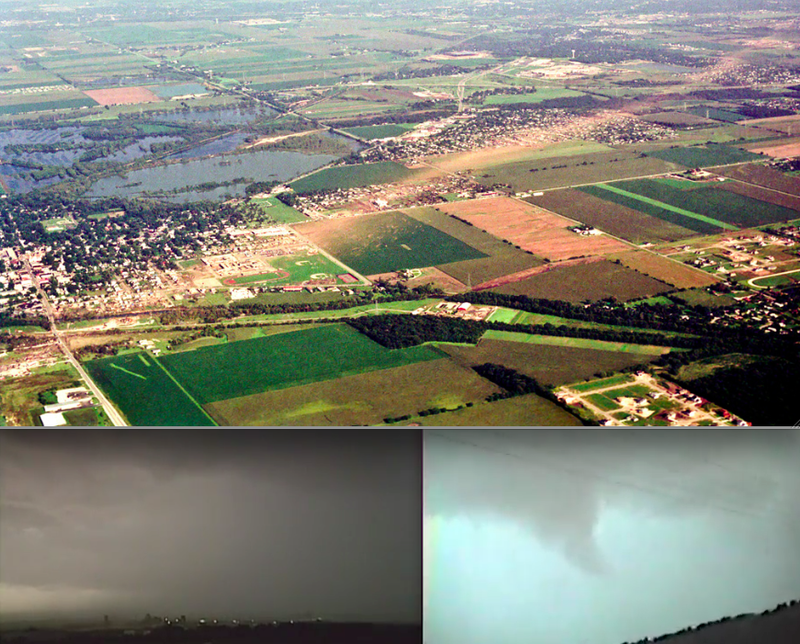 Video evidence suggests that the tornado had a complex multiple vortex structure. The first fatalities occurred as the tornado crossed Main Street, devastating homes and businesses in eastern Rainsville. A school bus parked at the DeKalb County School Coliseum was thrown 100 yards and stripped to its metal chassis. The tornado rapidly intensified north of Main Street and reached peak intensity as it swept over Lingerfelt Road, where several well-constructed homes vanished. Some of the most intense tornado damage ever documented occurred at 1608 Lingerfelt Road, where a two-story brick home was swept completely away. An NWS survey found that an 800lb anchored safe had been ripped from the home’s foundation and thrown 200 yards to the northeast. The door to the safe, which had been closed, was torn open and completely off. A large concrete porch weighing thousands of pounds was shattered and blown away from the destroyed home. Additionally, sections of pavement were ripped from the residence’s driveway, and the home owner’s truck was rendered completely unrecognizable after being thrown more than 250 yards (NWS, 2011). The damage to this single property is the reason for the inclusion of the Rainsville tornado in the list of the strongest tornadoes ever recorded. Incredible damage also occurred at several nearby properties. Large stone pillars were ripped from the ground at one home, and a section of slab foundation was uprooted at another. 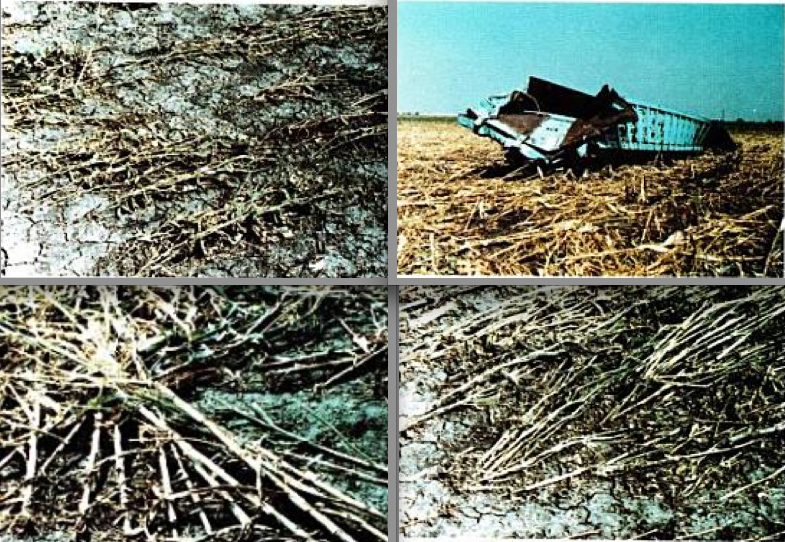 Damage patterns suggest that the EF5 damage was caused by extremely powerful suction vortices that made brief contact with the ground, leading to the erratic nature of the destruction. Grass scouring and pock marks from high speed debris were also photographed near Lingerfelt Road and areas to the north, further evidence of the tornado’s awesome power. More images detailing EF5 damage on Lingerfelt Road can be found here. Views of damage near Rainsville. At left, only the twisted chassis of a school bus remained after the tornado crossed Main street. At right, severe tree damage near Crow Lane. View of 1608 Lingerfelt Road, where an NWS survey team documented some of the most intense tornado damage ever recorded. The owners of the large, two-story brick home survived with several neighbors in an underground storm shelter. The tornado breeched the top of the storm cave, partially exposing the people huddled inside. An interesting feature of the damage was the sharp boundary (marked by scoured grass) separating the EF5 damage from standing trees a short distance to the east. Trees immediately south of the home were blown over but not debarked, whereas vegetation across the street was stripped bare. Visible grass and pavement scouring a few yards north of the home hints at the presence of a powerful wind feature that descended from the tornado and made contact with the ground after passing over the foundation. At left, view of debarked trees and severe vegetation damage northeast of Rainsville. Pavement scouring is visible at right center (Image by Mark Almond). At right, another instance of pavement scouring near Sylvania (Image by Melissa Smith). Aerial view of devastation along County Road 441. At bottom, a before view of two large homes visible in the lower left corner of the top image. A survey team documented vegetation scouring and sections of sidewalk that were torn from the ground in this area. Mike Zahurak photographed the tornado from the Village Center Shopping Plaza as it crossed over Lantern Lane at F5 intensity. An excellent website with information on the tornado can be found here. □ In the summer of 1985, an unprecedented outbreak of long-tracked tornadoes swept through eastern Ohio, Pennsylvania, New York and Ontario. The event was notable not only for the incredible intensity and longevity of the storms but also for being the only violent tornado outbreak ever recorded in the region. In total, the storm system killed 88 people across the United States and Canada and left more than 500 million dollars in damage. The only tornado awarded an F5 rating during the outbreak began its 47 mile path of destruction in Portage County, Ohio. After ripping through sparsely populated forestland, the tornado swept through the city of Newton Falls at F3 intensity. Damage was widespread throughout the town, but no fatalities were recorded. As the tornado continued eastward at 50mph it gained strength, leveling rural homes north of Lordstown. The tornado was approaching F5 intensity as it entered the outskirts of Niles, a manufacturing city south of Warren. Massive industrial tanks more than 30ft high and weighing 75,000 pounds were crumpled like soup cans, one of which was rolled 60 yards onto a nearby road. Large, well-constructed homes lining Lantern Lane were swept completely away as the tornado roared through cul-de-sacs around the Niles Union Cemetery (Grazulis, 2001). Pronounced wind rowing was noted as the tornado made a slight curve to the north and headed towards the US 422. Three people were killed as two vehicles were thrown from the road. On the west side of the highway, the Niles Park Plaza and a large skating rink were leveled and partially swept away, causing additional fatalities. 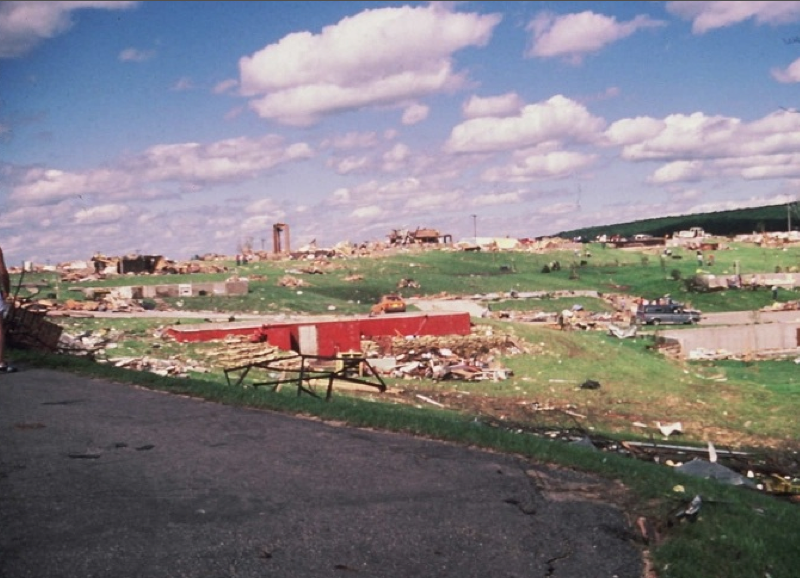 As the tornado continued eastward towards the Pennsylvania border it maintained F4 intensity and completely demolished several rural residences. The tornado remained fairly narrow throughout its life, with the primary damage path never surpassing 150 yards in width. After crossing into Pennsylvania, the storm entered the industrial area of Wheatland at F5 intensity. A man shielding two children in a ditch was torn from the ground and later found dead in the debris of a destroyed business a block away. Nearby, a six-year old boy running home from a baseball game was caught outside and killed by the storm (Ivory, 2007). Four more died in separate buildings at the intersection of Church Street and Ohio Street. The tornado may have reached peak intensity during its second wind maxima on the east side of Wheatland. A trucking plant was stripped of its roof and walls, and the steel-beam frame of the building was “twisted like a pretzel” (Grazulis, 2001). Sections of pavement were scoured from the plant’s parking lot, and surveyors documented pieces of debris and paper wedged beneath the remaining asphalt. Minutes after exiting Wheatland, the tornado weakened and dissipated. In total, the violent tornado killed 11 people in Ohio and seven in Wheatland. A damage survey concluded that the tornado caused F5 damage both in Niles and in Wheatland. Yet despite the severity of the building damage, photographic evidence indicates the tornado failed to cause significant tree debarking in the worst affected areas. As discussed in Part II, violent tornadoes may cause some extreme damage indicators but not others. The reason why damage patterns differ so wildly is unknown. The Niles Park Plaza was leveled and partially swept away as the tornado crossed the US 422. Next door to the plaza was the Autumn Hills Retirement Home, where several apartment buildings were completely destroyed.